Do you love an intellectual challenge? Enter the legal profession. 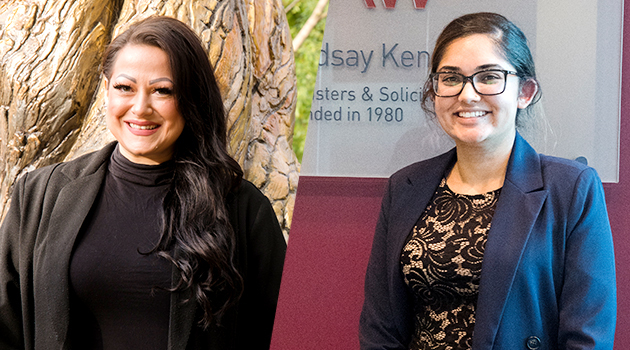 Pawanpreet Gill and Melissa Solomon, two recent graduates from UFV Continuing Education’s Legal Administrative Assistant (LAA) program, have found a stimulating work environment at a full-service law firm, Lindsay Kenney LLP, based in Langley and downtown Vancouver. However, both took a few detours on the way. “I started my university studies in psychology,” Pawanpreet says, “but I switched to political science and criminology when I discovered I had an interest in law.” Unfortunately, after three years, personal setbacks led her to abandon her studies in order to find full-time work. As for Melissa, she first tried her hand at personal training and kinesiology studies. She then moved on to earn a diploma in holistic nutrition and to start a degree in psychology. When each option proved unsatisfactory, she revived an old childhood dream. Equipped with top-notch skills, both women were ready to answer the call when opportunity came knocking. However, landing a job is only a stepping stone for the two grads. Both have enrolled in UFV Continuing Education classes to pursue a Paralegal certificate. Melissa finds that she can apply what she learns on the job. “I’m studying Legal Research and Writing right now and it is really applicable because I have the opportunity to draft documents as part of my work,” she says. With locations in Vancouver and Langley, B.C., Lindsay Kenney LLP is a full-service law firm with a team of 37 lawyers, supported by more than 80 paralegals, legal administrative assistants, managers, and administrative staff, some of whom have been part of the team for over 25 years. As a growing law firm with a thirty-five year history in the Lower Mainland, Lindsay Kenney values diversity. The firm is also the B.C. regional member of Mackrell International, a global network of legal firms. This membership enhances the firm’s ability to provide clients with access to international legal advice. INTERESTED IN HOSTING A PRACTICUM STUDENT?